it’s official – i’ve got bread fever. it started innocently with making a homemade baguette, which lead me to trying homemade tortillas, + now? pitas. if i’ve learned anything from this carbtastic journey (other than the fact that, whoa, i really love carbs), it’s that homemade breads are far more delicious than their store-bought versions + so much easier to make than i imagined. for real – i haven’t purchased a baguette, tortillas, or pitas in over two months – i’ve made them all from home instead. when making these for the first time, i worried that they wouldn’t ‘puff’ in the oven, which is how the pockets form. my worries were for naught, as each pita puffed perfectly, resulting in glorious pita pockets. i’m not sure what makes them puff – science? a magical combination of ingredients? little oven elves who puff up each pita personally? either way – it worked + the results were fantastic. oh, how do they taste, you ask? amazingly delicious. they’re soft, tender, + flavorful, with an absolutely perfect texture. they make wonderful pita sandwiches, they’re delicious dipped into soups + stews, + i’m planning to use them to make pita pizzas tomorrow evening + pita chips this weekend. they’re delicious, easy-to-make, *and* versatile – a winning combination in my book. 1. make the dough: mix the dough 8 hours to 3 days before baking. there are two methods: a stand mixer method + a mix-by-hand method. mixer method: in the bowl of a stand mixer, combine all the ingredients. with the paddle attachment, mix on low speed (#2 if using a KitchenAid) just until all the flour is moistened, about 20 seconds. change to the dough hook, raise the speed to medium (#4 on a KitchenAid), + knead for 10 minutes. the dough should clean the bowl and be very soft + smooth + just a little sticky to the touch. add a little flour or water if necessary. mix-by-hand method: in a large bowl, combine all the ingredients except for a scant 1/4 cup of the flour. with a wooden spoon or your hand, mix until all the flour is moistened. knead the dough in the bowl until it comes together. sprinkle a little of the reserved 1/4 cup flour onto the counter + scrape the dough onto it. knead the dough for 5 minutes, adding as little of the reserved flour as possible. use a bench scraper to scrape the dough + gather it together as you knead it. at this point it will be very sticky. cover it with an inverted bowl + allow it to rest for 5 to 20 minutes. knead the dough for another 5 to 10 minutes or until it is soft + smooth + just a little sticky to the touch. add a little flour or water if necessary. 2. let the dough rise: using an oiled spatula or dough scraper, scrape the dough into a 2-quart or larger dough-rising container or bowl, lightly greased with cooking spray or oil. press the dough down + lightly spray or oil the top of it. cover the container with a lid or plastic wrap. refrigerate the dough overnight (or up to 3 days). 3. baking day: preheat the oven to 475°F one hour before baking. have an oven shelf at the lowest level + place a baking stone, cast-iron skillet, or baking sheet on it before preheating. 4. shape the dough: cut the dough into 8 (for larger pitas) or 12 pieces (for smaller pitas). work with one piece at a time, keeping the rest covered with a damp cloth. on a lightly floured counter, with lightly floured hands, shape each piece into a ball + then flatten it into a disk. cover the dough with oiled plastic + allow it to rest for 20 minutes at room temperature. roll each disk into a circle about 1/4 inch thick (don’t roll them too much thinner than that or they won’t puff). allow them to rest, uncovered, for 10 minutes before baking. 5. bake the pita: 3 minutes before baking, spritz the top of each pita with a bit of water. after 3 minutes, place 1 piece of dough directly on the stone or in the skillet or on the baking sheet, + bake for 3 minutes. the pita should be completely puffed but not beginning to brown. the dough will not puff well if it is not moist enough, hence the spritzing before water prior to baking. proceed with the remaining dough, baking 3 or 4 pieces at a time if using a stone or baking sheet. 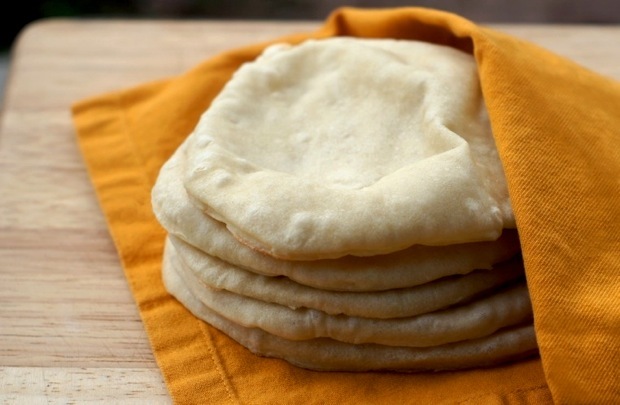 using a sptaula, transfer the pita breads to a clean towel, to stay soft + warm. allow the oven to reheat for 5 minutes between batches. the pitas can be reheated for about 30 seconds in a hot oven or microwave before serving. I’ve got home-made bread fever too! I started making my own bread when I lived in San Francisco and I fell in love with that. And what about pitas? Of course I would love to make them, I’ve never thought about it before, they’re just great and many thanks for the recipe! you’re so welcome, katia. isn’t homemade bread just the best? i bet you had access to some great ingredients (especially sourdough-related ones!) when you lived in san francisco! Previous post: GIVEAWAY – SodaStream home soda maker!